Slips, trips and falls account for thousands of workplace injuries every year, in many cases resulting in musculoskeletal damage, fractures, dislocations and bruises. They can also occur of course in church buildings and outside on pathways and in car-parking areas. Below we have outlined common causes of each and how you can reduce the risk in your church and workplace. Slips occur as a result of a loss of traction between a person’s foot and the floor underneath. Some common causes include liquid spills, wet cleaning, dusty surfaces, highly polished floors, wet or icy pathways, steep ramps, and poor lighting. Certain types of flooring materials can also make a floor more prone to being slippery – including glazed tiles, concrete (especially when worn as it absorbs more moisture), terrazzo, and steel plate. Tripping usually happens when a person catches their foot as a result of low obstacles – often ones that tend to go unnoticed. Common causes of trips include uneven floor surfaces, buckled carpets or mats, cracks, potholes, changes in floor levels, objects or cabling across walking areas, and inadequate lighting. Falls can occur as a result of both of the above, and also from heights or from using ladders or step ladders / stools. Risk management for slips, trips and falls is largely the same as for any type of risk – which involves identifying hazards, assessing the risk level, taking risk control measures, and regular reviewing and monitoring. Risk control measures may include eliminating the hazard, substituting it with a safer option, isolating the risky area, redesigning the area, conducting repairs, and implementing good housekeeping procedures. For example, for a slip hazard you might put down slip-resistant mats (substitution), isolate a wet area (isolation), improve lighting (redesign), repair water leaks (repairs), and put procedures in place for prompt clean-up of spills (housekeeping). Floors that become very slippery when wet. Water leaks from fridges or machinery. Worn anti-slip floor paint or coatings. Isolated steps, and poorly defined and / or designed steps and stairways. Poor lighting and / or glare from lights. Floor holes, cracks or unevenness. Ice, vegetation or debris on outside walkways. Potholes and cracks in carpark areas. Slip hazards can be removed through prompt cleaning of spills, using signage (such as during floor cleaning), improving drainage, applying slip-resistant floor coatings, putting down non-slip rubber-backed mats, and providing good lighting – especially where a change in floor textures occurs (such as between carpeting and tiles). An absorbent entrance mat may also prevent water from being dragged inside on people’s shoes – especially important during wet weather! For outside areas it may be necessary to remove debris from walking areas and applying salt treatment for ice or frost. Trip hazards may involve doing a few repairs such as for damaged tiles or carpeting, holes and cracks. If the use of cables is causing a problem in walk-through areas, it may be necessary to look into installing more electrical sockets. If objects such as files, boxes or tools are causing people to trip, you may need to install more storage cupboards or shelving. On steps and stairways, step edges should be clearly defined with coloured strips and nosings, and adequate lighting and handrails should be provided. For more detail on prevention of accidents on steps and stairs see our previous article. 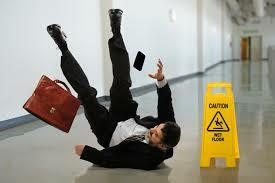 Falls may often be prevented by dealing with slip and trip hazards as mentioned above. For ladder use, please see our earlier article on ladder safety. More information and resources on risk management for slips, trips and falls in your church organisation or workplace can be found at Safe Work Australia or on your State’s Worksafe website.